Who is a small business owner? A singular definition would be that it is someone who does not want to work for someone else. They want to be their own boss. By extension, they do not want to do anything that does not interest them. This means everything that needs to be done for a business to grow does not get done. Many still advertise on yellow pages and direct mail, disconnected from the media experiences of their customers who are largely digital – mobile and social. The digital media landscape is changing much too fast to expect the small business owner to keep up. 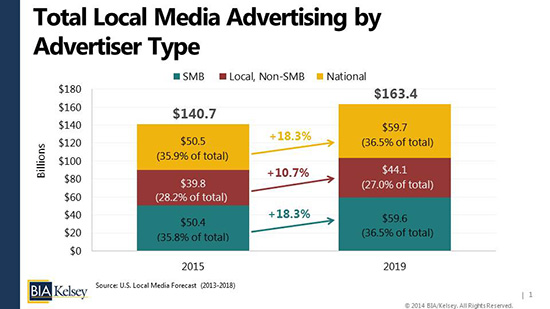 Yet local media advertising spending is projected to grow by $10 billion to $60 billion by 2019. As Greg Sterling from LSA writes eloquently “there is a “moral” dimension to helping SMBs succeed with digital marketing. If they don’t get it right they will fail and our economy will not only suffer but we’ll all be reduced to choosing between Walmart and Subway: giant corporations that don’t particularly care about communities and franchises that have no local character.” We talk to hundreds or new small businesses each week and hear their struggles with finding and retaining customers. We also see the struggles of our sales channel (payment processors) as it transitions from selling credit card processing to becoming a true business consultant to small merchants, genuinely interested in solving a real business problem rather than just pushing a product. Each week, we train tens of merchant sales people so they can become the first line experts on digital marketing and depend on products like ours to provide a seamless service that businesses owners can succeed with. As Greg ends his blog, “the economy needs them to succeed (lifestyle businesses or not) in order to maintain the vibrancy and diversity of local communities. Otherwise, as I said, the future is Walmart and Subway“.